Tip-2-Tip Hybrid Wood Core – for the board’s core Naish went with different densities of vertically laminated wood and a highly developed thickness taper, as well as top and bottom laminates unique to each board model. Naish manufactures each board to offer excellent durability and an exact flex characteristic for specific riding performance. NASA/Tech-2 Laminates – a unique framework of different composite laminates over the top and bottom of the board interlocked by composite I-beams through the wood core. This constructions system was originally developed for the 2009 Thorn board. Hi-Ten Response Flex – a completely new performance is obtained by combining the NASA/TECH-2 laminates with the board’s rocker and outline. 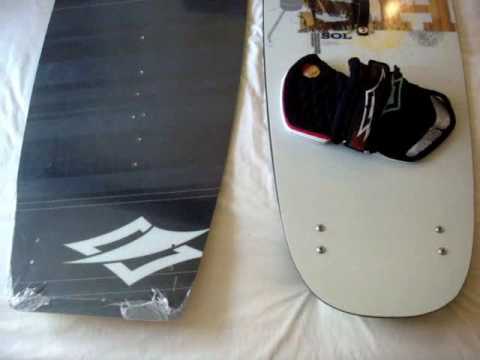 Consequently the board rides higher, faster, and smoother. Pro Park Performance – this is Naish’s guarantee that the board will appear to a majority of riders thanks to its excellent new wake-style pop and incredibly forgiving handling. If you are an intermediate or expert freestyle rider and you’re looking for an alternative to the Thorn CC, Naish has the 2010 Momentum board to offer. The Momentum board is incredibly forgiving, is very easy to control, and offers tons of pop. The board’s higher rocker line means it offers very smooth landings and plenty of pop. Pulling off and landing the craziest moves is a piece of cake with the 2010 Momentum board. Its rocker and outline offer an incredibly smooth freestyle performance. The Momentum board’s increased width and surface area means it glides easily. When you combine the board’s increased width and surface with its rocker, you get incredibly smooth landings. How does the Momentum board compare to the Thorn CC? The Momentum boards has a more wake style pop off the full rocker when ridden flat while the Thorn CC gets its pop from the its rock solid edging and powerful tips. The Momentum board has an outline that is more parallel over the majority of the length of its rail to balance the increased rocker. The bottom line is that if you want an alternative to the Thorn CC, if you want a board that will help you push yourself to become even better, the Momentum board is a good choice.